What about New Years Resolutions? With over 68% of Americans in the overweight category, it’s not surprising the number 1 New Years Resolution is related to weight loss. Unfortunately, over 80% of them are considered failed by February 1st each year. Often times we set resolutions that are not specific or realistic. Like to “Get to the gym more” or “Get to the gym 6 days per week” when we may not have been going at all. Starting out with a small goal that includes a time period, like “Get to the gym 2 times per week in January and February”. Setting a goal that seems achievable will build your confidence when you achieve it. Our food behaviors have been the way they have been our whole lives. Making changes that last are very difficult alone. Also, with so much false diet info out on the market, seeking real, science-based support from a Registered Dietitian can help support change. Seek support from family members for positive reinforcement to keep you going. Studies show weekly weighing can have great benefits for a weight loss program. However, many clients of mine tend to me discouraged with small weight loss or maintenance over weeks time. That said, focus on your feelings over the scale. How is your energy level? How are your clothes fitting? How does your body feel? When we put our focus onto other aspects of weight loss, we tend to improve our outcomes. According to the American Psychological Association, 44% of Americans state their stress is up over the last five years. The impact of stress on health, especially body weight is under valued. Seeking stress management techniques in 2017 is a great resolution for your health. Adding things like 10 minutes to wind down, weekly massages, daily exercise, adult coloring or finding humor are great strategies. 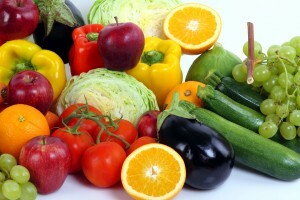 Americans are not eating enough fruits and vegetables, the average person eating 2 servings per day. Without filling up on fruits and veggies, it’s easy to overeat calories everyday. By adding fruits and vegetables, there are countless benefits, but naturally it displaces food intake of less healthy foods. Try setting a realistic goal like eating 3 one-cup servings of fruits and vegetables on 5 days of the week!